Joe and Tom, partners in a dental practice, came to us looking for help. Joe had owned the practice for several years, while Tom was a new owner. Both were interested in accumulating wealth for retirement, but they recognized that they were in different places in life. 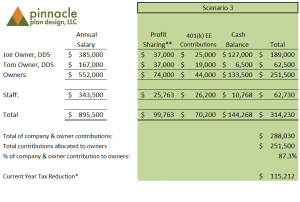 We started our discussion with their existing Safe Harbor 401(k) profit sharing plan. By defining each individual as their own “group” we could allocate the maximum to both Joe and Tom. Since Joe is over 50 years old, he is allowed a catch-up contribution of $6,000. The cost is 7.5% of compensation to the employees. This resulted in 82.1% of all employer money allocated to Joe and Tom. 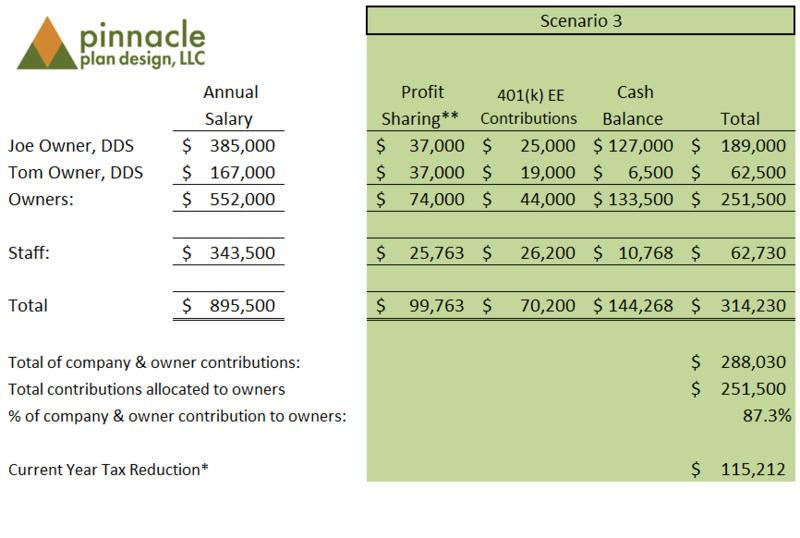 Joe really wants to put away more than the defined contribution maximum. 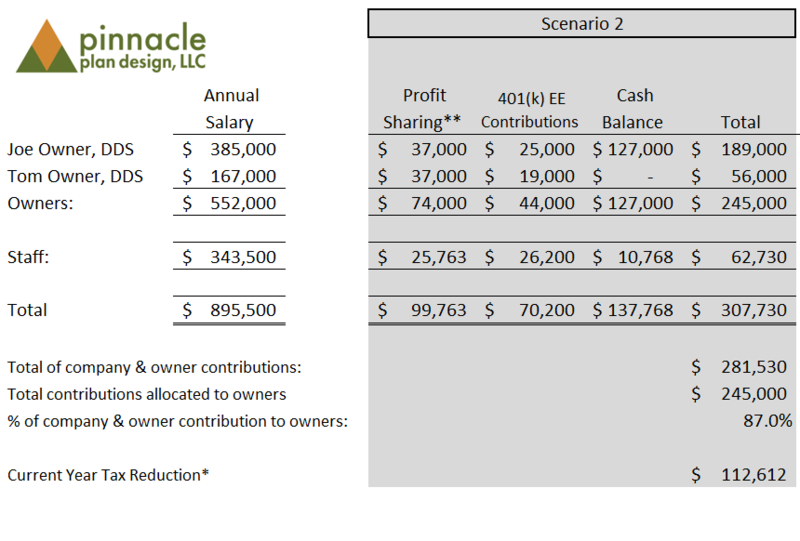 Based on the demographics, we found that we could add a cash balance plan and define a contribution credit of the lesser of $127,000 or 50% of compensation for Joe. Along with this, we have a cash balance credit for the staff of the lesser of $1,500 or 3.5% of compensation (total cost is just under $10,800). At this point, we did not include Tom in the cash balance plan. This resulted in 87.0% of all employer money allocated to Joe and Tom. Finally, Tom decides that he wants to participate in the cash balance plan. Without further increasing the staff cost we find that we can define a contribution for him of the lesser of $6,500 or 4% of compensation. This resulted in 87.3% of all employer money allocated to Joe and Tom. Joe and Tom are very happy with the progression of their plan design. 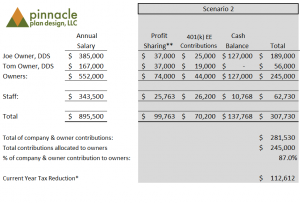 Tom understands that if he wants to cut back his contributions in a given year, he may simply reduce his deferrals or his profit sharing allocation. Every company is unique, as are their retirement needs. 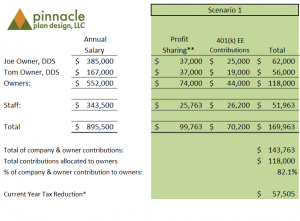 Our consultants at Pinnacle Plan Design will sit down with you and will listen to your questions, desires, and concerns and will design a plan or plans that will best suit your needs. Please contact us for more information. 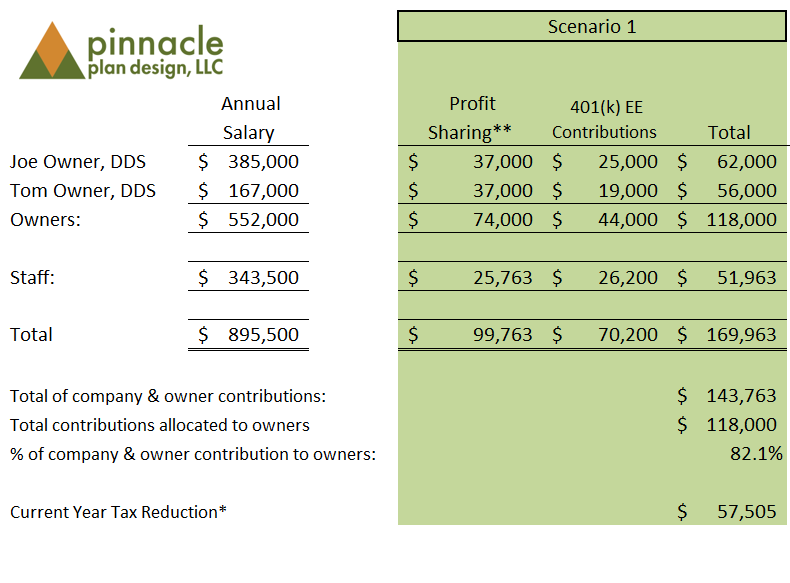 * Assumes a 40% tax rate; tax savings for owners’ contributions are deferred; owners’ 401(k) deferrals are included and assumed to be pre-tax. Plan designs are for illustration purposes only.